It was with this collection of hair sculptures that Sandra de Groot obtained her degree in 1998 from Minerva Art Academy in Groningen, the Netherlands. She subsequently worked on various interior productions for magazines and completed an education as teacher of visual arts and design at the same Minerva Art academy. Atelier C H A O S embodies diversity, crossover, art and design. “Autonomy and conceptual freedom are fundamental to me. Experimentation with materials and the melding together of disciplines are an infinite source of joy in the creation process..."
Sandra’s extraordianary studio, once the workspace of renowned Dutch artist & printer H.N. Werkman, is situated along the Lage der A canal in central Groningen. It is a great place for new concepts, experiments and mixed art forms. 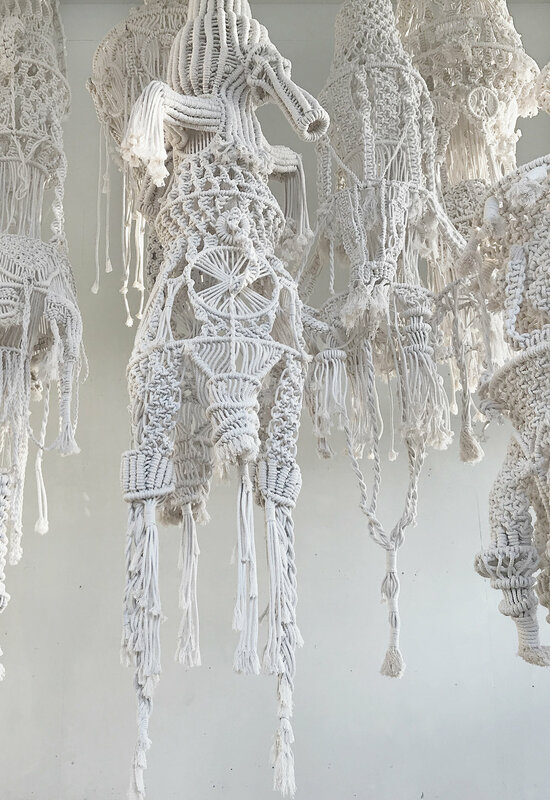 Sandra de Groot is currently creating a collection of kNOTs, exploring craft, technique and strategy in both sculptural and architectural ways. Sandra executes her own designs. Each sculpture is knotted by hand and during that process contemporary innovation is generated. "The sculptures evolve according to an inner logic that is all mine. Only when the sculpture attains a textile form of attraction and becomes self-contained, I literally let go the ropes.” By working with natural, high quality cotton, Sandra is able to direct abundant attention to texture, structure and form. With her kNOTs installations, it is Sandra’s goal to heighten awareness by actually confronting the viewer with large quantities of knots and ropes. This raises questions about (lengths of) time, technique, intensiveness and intensity. And it creates the opportunity for a transparent dialogue between object, viewer and maker. Sandra also teaches art history and visual education at the department of Interior Design. By always stretching the boundaries in her areas of interest and linking several disciplines, she succeeds in making changes tangible. This strongly characterizes Sandra’s work and has left its mark on the many diverse project she has developed and executed over the years.